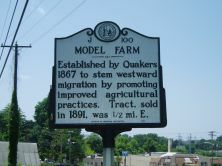 Established by Quakers 1867 to stem westward migration by promoting improved agricultural practices. Tract, sold in 1891, was 1/2 mi. E.
Following the Civil War Quakers in sizable numbers left piedmont North Carolina for the Midwest. The route followed by many passed through Baltimore, where a group of Friends organized in 1865 sponsored efforts to help their southern brethren be self-sustaining. 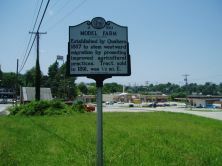 The Baltimore Association sponsored schools (forty-four in North Carolina) and set up a demonstration farm near High Point.